Rhonda Pickett, MSN, RN, AOCN, is a nurse navigator at Winship Cancer Institute of Emory University providing individualized assistance to patients with a breast cancer diagnosis. Ms. Pickett assists patients, their families and caregivers in overcoming healthcare system barriers by serving as a point of contact. She provides education and resources to help facilitate informed decision making and timely access to quality health and psychosocial care throughout the cancer journey. She has over 30 years of experience in the adult oncology arena including inpatient hospital, outpatient hospital, private oncology physician practices, chemotherapy infusion, and clinical nurse specialist/educator areas. 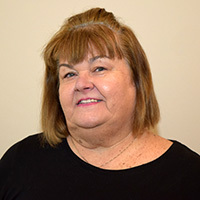 Ms. Pickett received her RN from St. John's School of Nursing in Springfield, Illinois and her Bachelor of Science in Nursing from University of Illinois - Springfield, Illinois. She obtained a Master of Science in Nursing from St. Louis University, St. Louis, Missouri. She is an Advanced Oncology Certified Nurse by the Oncology Nursing Society.